Now when you sleep your devices can be charged all thanks to this Modern Alarm Clock With USB Charging. The alarm clock is nice and black with big red numbers and there is an build in sensor that can adjust the brightness automatically if you want. Also there are two USB ports that can charge your devices while you are sleeping. There is 2.1 amp available for charging so that everything will be topped up while you sleep. There is also a big snooze button on the top to making turning your alarm off easy. 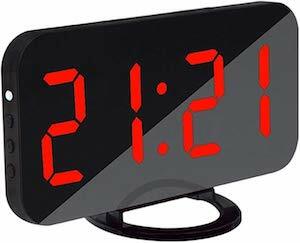 Come and get your Modern Alarm Clock With USB Charging.